NJ DOG BLOG (from cats and dogs to aardvarks and zebras ... and everything in between): ‘Railway Post Office Dog Day’ Sat., July 16 in Danbury, Conn.
‘Railway Post Office Dog Day’ Sat., July 16 in Danbury, Conn. The Danbury Railway Museum will host a celebration honoring the legacy of Owney, the Railway Post Office dog from 10 a.m. to 4 p.m. Sat., July 16. Owney was a stray dog which found its way into the Albany, N.Y. post office in 1888 and was soon adopted by the Railway Mail Service clerks and became the mascot of this government service. He traveled throughout the state, and then all over the country, in the RPO cars, eventually venturing around the world as a U.S. Post Office Department emissary in 1895. In 2011, the U.S. Postal Service issued a postage stamp to honor him. 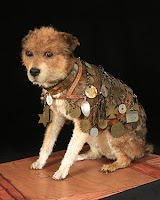 Owney has been preserved and is on display at the National Postal Museum in Washington, D.C. The museum is at 120 White St., Danbury, Conn. Admission for this event is $10, which includes a train ride, access to all activities, and a free hot dog. For more information, 203-778-8337 or www.danburyrail.org.